TORONADO (IRE) (Bay 2010-Stud GB 2015, Aust. 2015). 6 wins-3 at 2-to 1m, Royal Ascot Queen Anne S., Gr.1, Goodwood Sussex S., Gr.1. Out of a half-sister to SW Casamento. Sire of 74 rnrs, 32 wnrs, inc. SP Almufti, Revelstoke, Watan, Baylagan, El Ingrato and of Come Back, Droit de Parole, Tuned, Mon Ouragan, Topical, Yolo Again, Eesha's Smile, Arrow, Chasing the Rain, Distant Mirage, Festina Plente, Gharabeel, etc. His oldest Aust.-bred progeny are 2YOs and inc Heaven's Bonus, Powertrain, etc. Grey Factor (f. by The Factor). 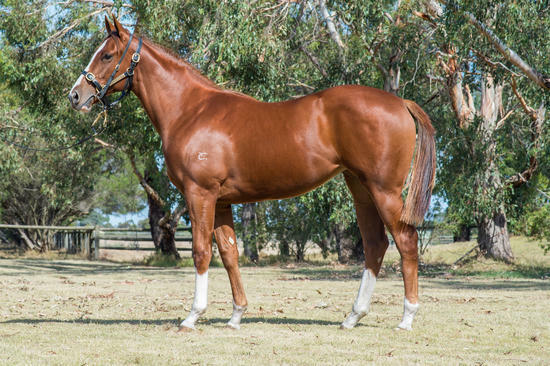 Winner at 1050m in 2018-19 in Aust. Not a Hint. 6 wins to 1200m, A$111,275, ATC Azek Ultimate Paver H.
Justa Hint. 4 wins from 1200m to 1600m, A$100,265, MRC Mypunter.com H., 2d VRC Western Otway H., MRC Le Pine Funerals H., SAJC Resourceco H.
Jet Express. 3 wins from 1300m to 1600m, A$88,380, to 2017-18, SAJC Letcher Moroney Account H., Goldin Farms H., Quayclean P., 2d SAJC Adelaide Galvanising P., Ubet P., Ubet H., 3d SAJC Wolf Blass & Associates H., Holdfast Insurance H.
Pacific Highway. 6 wins from 1100m to 1650m in Aust. Trusted Warrior (Trusting). 5 wins from 1200m to 1600m, A$83,562, to 2018-19, TTC Launceston Mitsubishi H., TRC Trchobart.com.au H., Women in Tourism & Hospitality H., TTC ATA Celebrates 50 Years H., 2d TTC Sires Produce S., TRC Carlton Draught H., Rogerson & Birch Surveyors H., 3d TRC Hobart Guineas, L, Carlton Draught H., TTC Sun Stud H.
Acceptile. Winner at 2, BRC Sky Thoroughbred Central 2YO P., 2d BRC Coca Cola 2YO H., Kiss & Make Up Aquis Farm 2YO H., Ipswich TC Sirromet Bundamba 2YO H., 3d BRC Dr Lilian Cooper 2YO H., Lite 'n' Easy 2YO H., Fernwood Fitness 2YO H., Qld Tatt's RC Winning Edge Presentations 2YO H.
Miss Pussigato. Placed in Aust. Irving Lipschitz. 2 wins at 1400m, 1600m to 2019, Singapore TC Abundance S.
Gio Ponti's Legacy. Winner at 1000m in South Africa. LUCKY SECRET (Rubiton). 14 wins to 1300m, A$985,650, MVRC Schweppes S., Gr.2, MRC Schillaci S., Gr.2, 1000m-in track record time, MVRC Norman Carlyon S., Gr.2, STC Starlight S., L, MRC Sir John Monash S., L, Kevin Heffernan S., L, VRC Lawn H., MVRC Direct Mail Marketing Quality Flying H., Pulse Pharmacy Flying H., Beaurepaires Flying H., Quest Moonee Valley H., MRC Geoffrey Bellmaine H., Harvie Picken H., MVRC Festive Frolic Package H., 2d MRC Oakleigh P., Gr.1, Schillaci S., Gr.2, Rubiton S., Gr.3-twice, 3d MVRC Ian McEwen S., Gr.3. HINTING (Danzero). 3 wins. See above. Mo the Great. 3 wins at 1300m, 1600m, A$83,250, in 2017-18, 3d ATC Owner Benefits Card H.
Spicy Fruity. 2 wins at 1200m, 1400m, HKJC Robin's Nest H., Merry Merry H., 2d HKJC Jebsen Fine Wines H., Shek Wai Kok H., Sun Wui H.
Won't Tell (Rory's Jester). Placed. See above. Board Meeting (General Assembly). 6 wins-1 at 2- in France and U.S.A, Evry Prix d'Etoiles, Prix de Maisons-Laffitte, 2d Evry Prix La Fleche, L.